Dr. Soash is a program manager for National Systems Programs, a group of proprietary programs within Boeing’s Government Satellite Systems organization. He was appointed to this position in May 2016. Since 1998, Dr. Soash has held a variety of program management, systems engineering, and technology development positions within Boeing Satellite Systems. These activities have focused on the development, engineering, manufacturing, and integration of new satellite technologies for end user applications including communication, navigation, and reconnaissance. 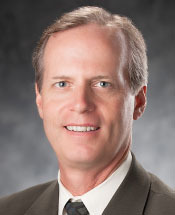 Prior to joining Boeing Satellite Systems in 1998, Dr. Soash worked at Hughes Electronics (formerly Hughes Aircraft) and held a variety of management and engineering positions supporting Government acquisition programs and corporate funded research and development efforts, including computer modeling and simulation. Dr. Soash has over 32 years of program management and systems engineering experience covering both hardware and software development throughout the full range of the acquisition cycle including requirements development, concept definition, system development, system production, and system support. Dr. Soash holds Bachelors, Masters, and Doctoral Degrees in Mathematics from UCLA, as well as a Masters in Business Administration (MBA), also from UCLA.